Explanation: Craters produced by ancient impacts on the airless Moon have long been a familiar sight. But only since the 1990s have observers began to regularly record and study optical flashes on the lunar surface, likely explosions resulting from impacting meteoroids. Of course, the flashes are difficult to see against a bright, sunlit lunar surface. 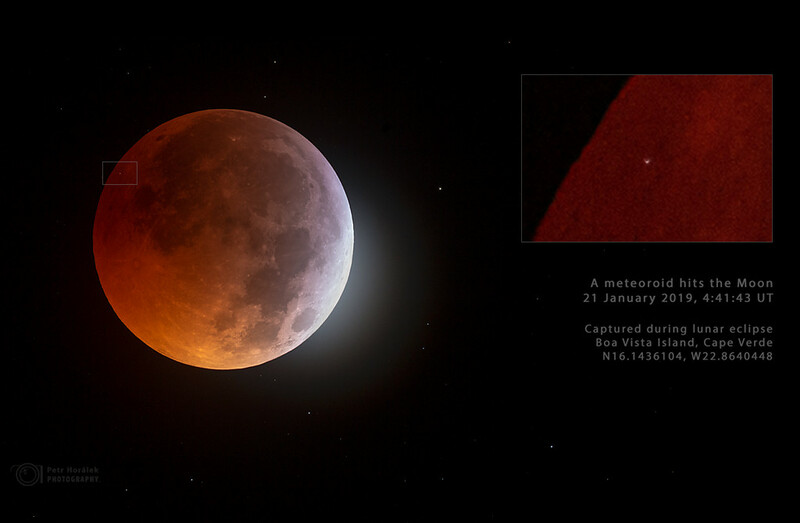 But during the January 21 total eclipse many imagers serendipitously captured a meteoroid impact flash against the dim red Moon. Found while examining images taken shortly before the total eclipse phase began, the flash is indicated in the inset above, near the Moon's darkened western limb. Estimates based on the flash duration recorded by the Moon Impact Detection and Analysis System (MIDAS) telescopes in southern Spain indicate the impactor's mass was about 10 kilograms and created a crater between seven and ten meters in diameter.